The Sikh Religion | Gurmat, in: Voices from Religions on Sustainable Development, 2016, Federal Ministry for Economic Cooperation and Development, p. 120 ff. The chapter on Gurmat shows that spiritual wisdom provides resilience and can guide us through all challenges towards the path of sustainability. The prerequisite is that we acknowledge that truthful religion is shaped by selfless devotion, concerned with the well-being of all humankind and is neither group-led nor interest-led. Religion ideally offers far-sighted guidance to humanity and to those who are in responsible political and economic positions. It does not seek power to govern or oppress people and does everything to avoid the misuse of religion (AG, M. 2, 474; M. 5, 534; M. 1, 145). In today’s world that is shattered by terror, it is in particular the responsibility of the adherents of religion to eradicate what is bad in us and our religious communities. We need to take a firm stand – even if this involves personal losses. When our actions match our words, honesty and sincerity arise. This is a prerequisite for justice, solidarity and good governance. Ultimately, it will lead us to peace and a conscious way of life in harmony with nature. Transformation is a choice (AG, M. 1, 474). It begins at home, with a look in the mirror. About the book: Religion is sometimes seen as a hindrance to development and peace. This book shows that religion can be part of the solution to the global challenges we face. It brings together the multifaceted wisdom of religions and indigenous traditions on sustainable development. More than 25 inspiring followers, theologians, practitioners and academics from the Bahá’í Faith, Buddhism, Christianity, Confucianism, Daoism, Hinduism, Indigenous traditions, Islam, Judaism, and the Sikh Religion share their spiritual and religious insights on the five dimensions of the new Agenda 2030: Planet, People, Prosperity, Peace and Partnership. Without claiming any form of representative authority, their authentic contributions increase our knowledge of religions and describe how religious actors promote development. The book demonstrates that common spiritual values are at the heart of all religious and indigenous traditions – and that bringing these virtues to life can contribute to overcoming environmental destruction, poverty, forced migration, corruption, terror, discrimination and injustice. The authors give cause for optimism that the Sustainable Development Goals of Agenda 2030 signed by 193 nations at the United Nations in September 2015 can be achieved through a conscious individual and collective effort – provided we ourselves are willing to change in the first place. All books offer an in depth explanation (Vichar) of Gurbani, thereby radically differing from all existing interpretations (Teeke), which are mostly products of Nirmale (like Darpan or Faridkot Teeka). The uniqueness of the books lies in accepting the fact that Gurbani explains the spiritual mystery of Oneness through metaphors, and is an interpretation of itself. Accordingly, no definitions have been borought from wordly dictionaries, but are purely based on key spiritual insights provided within the verses of the original scriptures themselves. 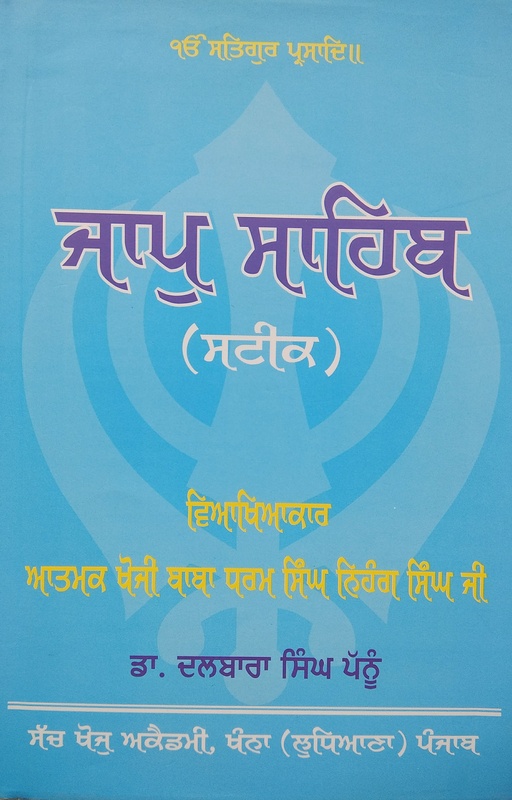 The explanation of Jaap Sahib, a composition by the 10th master Gur Gobind Singh, which contains may unique word creations, was dictated by Dharam Singh Nihang Singh to Dr. Dalbara Singh Pannu; former Director Regional Research Station, PAU Ludhiana; Member Crop Improvement Society of India; Member American Association for the Advancement of Science, Washington DC, USA. ਸਹਿਜ ਸਮਾਧਿ ਬਨਾਮ ਸੁੰਨ ਸਮਾਧਿ – Sahj Samadhi vers. Sunn Samadhi (Sidh Ghost Viaakhiaa), 1999, Sach Khoj Academy. ਨਾਦ ਵੇਦ ਬੀਚਾਰੁ (ਜਪੁਜੀ ਵਿਆਖਿਆ) – Naad Ved Bhichar (Japuji Viaakhiaa), 1996, Sach Khoj Academy. 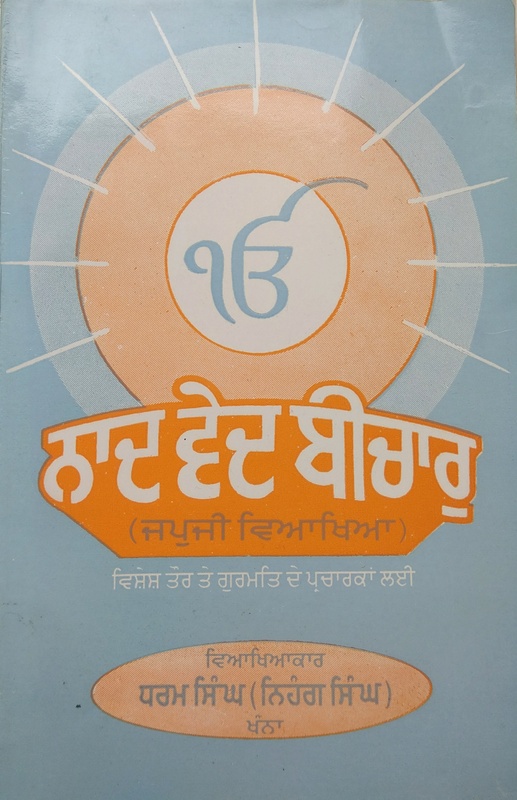 Vakh vakh vishean te gurmat anusar vichar, in: Gurmat Prakash, 2001–2003, Dharam Prachar Committee, Shiromani Gurdwara Parbandhak Committee Amritsar. Ki Gur Nanak Dev Ji Naal ‘Gur’ Di Jaghaan ‘GURU’ Lag Sakda Hai? Jappna Te Simran Karna Naam Japan Di Gurmati Vidhi Ki Hai? Ki Gurgaddi Gurbani Guru Gyaan Nu Nahi Mili? Menschenrechte in der Sikh-Religion [Human Rights in the Sikh Religion], in: Menschenrechte im Weltkontext. Geschichten – Erscheinungsformen – Neuere Entwicklungen, 2013, Springer VS.